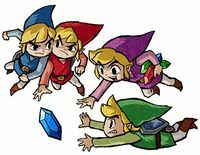 For the GameCube sequel, see The Legend of Zelda: Four Swords Adventures. For the single player component, see The Legend of Zelda: A Link to the Past. 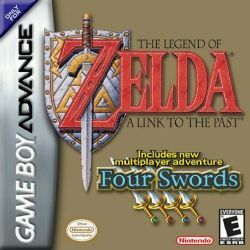 The Legend of Zelda: Four Swords is a Game Boy Advance game that was bundled with the Legend of Zelda: A Link to the Past. An enhanced version was released for free on DSiWare and renamed The Legend of Zelda: Four Swords Anniversary Edition in celebration of the 25th anniversary of the Legend of Zelda series. It features a new single player mode and new levels based on previous games in the series. This page has been accessed 32,375 times.